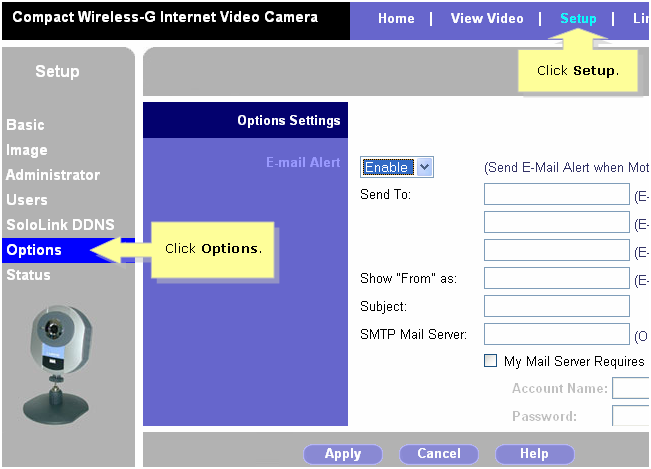 NOTE: If you are using a Mac computer to access the wireless video camera's web-based setup page, click here. On the wireless video camera’s setup page, click Setup then Options. On the Option Settings window, set E-mail Alert to Enable then enter the email settings of the recipient. • Send To - Enter at least one (1) e-mail address. The second and third addresses are optional. The e-mail alert will be sent to the e-mail address or addresses specified. • Show "From" as - Enter the e-mail address to be shown in the From field when the e-mail is received. • Subject - Enter the desired text to be shown as the subject for the e-mail when it is received. The subject must not exceed 48 alphanumeric characters. • SMTP Mail Server - Enter the address of the SMTP (Simple Mail Transport Protocol) server to be used to send e-mail. If the SMTP Server requires a login in order to send mail, check the box next to My Mail Server Requires Authentication and enter your Account Name and Password for the SMTP server. You may contact your Internet Service Provider (ISP) for more information. QUICK TIP: For more information about the other fields, click Help.